A few bloggers have been wondering about Tumblr and if they should get an account. Before I go into detail as to how to utilize Tumblr I’m going to explain why I use it. Note: Feel free to click on the images if you need to see a larger version. First of all, I use to blog extensively on Livejournal but a lot of people I followed and interacted with moved to Tumblr and eventually I gave in and got an account. Secondly, I know a few graphic designers or those who like to make digital fan art on Tumblr and it’s a great community to get creative ideas and to find resources such as textures or stock photos (that are royalty free). Posts from Lit, etc are auto-posted there and I’ve had a few visits from Tumblr. 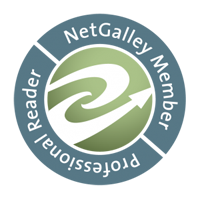 I also think it’s great place to use because people who stumble upon your blog, but don’t want to follow via email or RSS, but have a Tumblr account might be inclined to follow you straight from their Tumblr account. On their dashboard they can see your latest posts, etc. Of course there’s a downside: the person following you on Tumblr has to constantly be checking otherwise posts get lost in the sea of reblogs, but I think the benefits outweigh a minor problem. What exact purpose does Tumblr have if you aren’t using it as a blogging platform? For me, Tumblr is an extension to Lit, etc. I can utilize it to post quotes or various different types of photographs. These I wouldn’t normally post on the blog because you might end up seeing up to 4 different types of posts and I don’t want to overwhelm people. So if you have an instagram account and post bookish things, link it to a Tumblr account and post your images there. Just went to a used bookstore and walked out with 10 books? Take a picture and post it on Tumblr. Found a great infographic you shared on your Facebook page but don’t want to create a blog post for it? Put it on Tumblr! There’s so many things you can do with Tumblr. I like to describe it as a Pinterest type site, but it’s not. Unlike Pinterest you can add video, sound, and even just a quote to a post and the source remains intact on Tumblr (for the most part unless someone saves your image and reuploads it as their own). You can create a source link in addition to your regular post and it becomes a type of watermark. Also you can tag extensively, just make sure you tag according and not because something is popular. Furthermore, you can highlight previous posts by reblogging them and they appear on the dashboard immediately so you can always re-highlight past content. One of the benefits of Tumblr lies in the ability to get new exposure for your blog that you might not receive elsewhere. There’s an option to like something (the little heart on the right) and your name is attached to it and therefore this can lead other users to your own Tumblr. If you reblog something and make a comment this gets attached to the original post (via your own post and those reblogging it from YOU) and that means more exposure for you! So in many ways this is how you can build a following on Tumblr for your blog. You might be wondering why it’s necessary to like / reblog in order to gain a following or get noticed and it has to do with the settings on Tumblr. People will need to know your username in order to find you and if you’re using a different name from your Twitter, Facebook, or any other social media username then you’re pretty much anonymous on Tumblr. People that follow you will only receive your streamed content and vice versa for those you follow. You can find Tumblr users via the tags, but otherwise you remain anonymous. 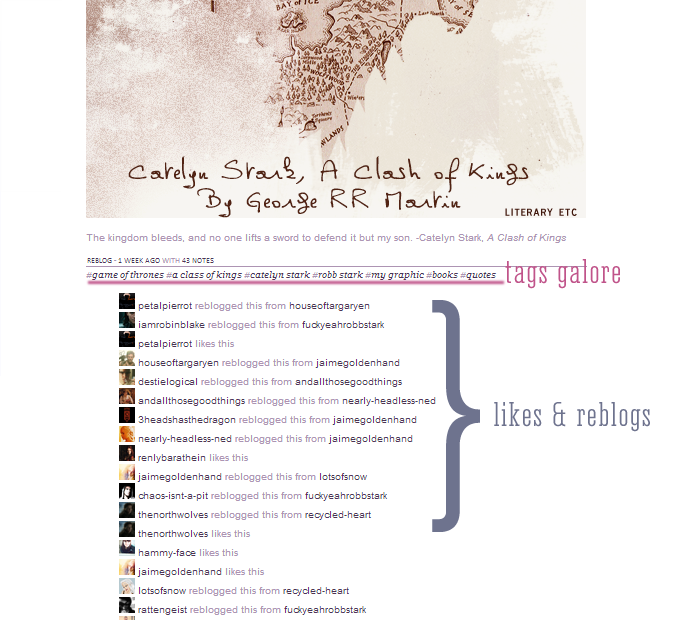 The above screenshot showcases the number of reblogs along with the users who liked it or reblogged it including from which account. Even if others reblogged it from someone else it’s all still tied to me. 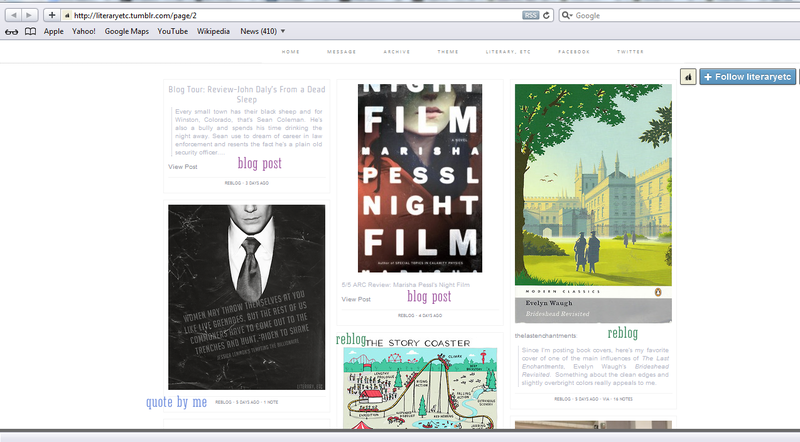 If you’re on WordPress (either free or self hosted) you can easily link up your tumblr account to auto-post. Just go to settings then sharing. From there you’ll see this screen and just add your link. The best thing about the auto-post feature is the tags you use on WordPress will be used on Tumblr so you’ll want to tag according. I need to start to retagging with author names. If by chance you forgot to add a tag to your blog post, but decide to edit it, it won’t update on Tumblr’s part, but you can update tags on Tumblr itself. In your dashboard, just click the little wheel to the right of the post and make your changes. You can also edit the entry to include any additional information or change the wording. I’m not familiar enough with Blogger in order to offer assistance, but I believe you should be able to synchronize auto-posting using IFTTT (there’s a few Blogger to Tumblr recipes here). If anyone using Blogger has successfully synchronized auto-posting to Tumblr let me know and I’ll modify this. As you can see there are 2 blog posts that were auto-posted from WordPress to Tumblr, a quote graphic made by me that has never been posted here, and 2 Tumblr posts I’ve reblogged. There are a lot of authors, publishers, and people in the book industry on Tumblr. Many of them I follow via my own account, but I reblog posts to Lit, etc’s account. Tumblr isn’t perfect though. It is prone to hang-ups and at times is down. Plus there’s no integrated commenting system so if you’re looking for feedback or comments, etc you aren’t going to get it there (although some users have installed a third party commenting system like Disqus). In the end, ask yourself if you’ll be providing additional content. If the answer is no then perhaps Tumblr isn’t for you, but if you are looking to supplement your blog’s content and build a network outside the blog and make your blog more accessible to others then Tumblr might work for you. Questions or comments? Do you use Tumblr for your blog? I know a lot of bloggers who are using Tumblr to auto post their blog posts, but that’s it. I truly believe in order to take advantage of it you need to supplement the content and not just rely on just blog posts. It’s very much a communal site and you need to give something back in order to get something. 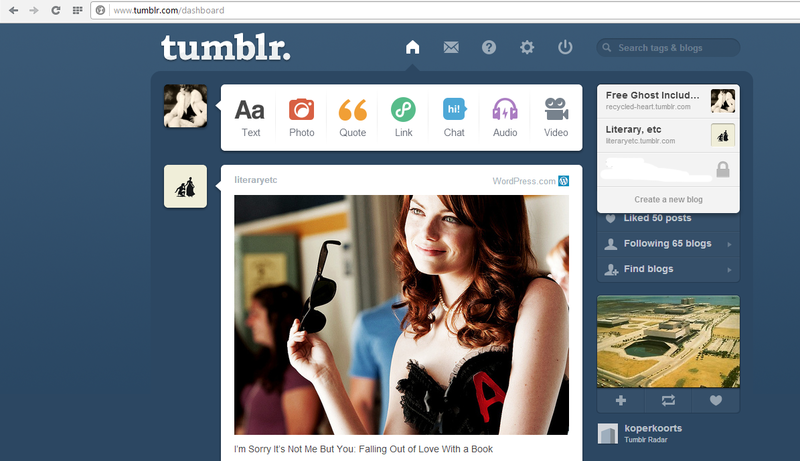 Even though I rarely use tumblr, it is pretty addicting. I still haven’t figured my way around it, but it’s entertaining! I don’t know if I’ll ever use it to link to my blog. As I said, I’m not that active on it, but maybe in the soon future. Thank you for this post! I recently created a Tumblr account and I wasn’t sure what to do with it. I think the only thing I have going on right now with my Tumblr is an IFTTT recipe for my Instagram pics to post on Tumblr. 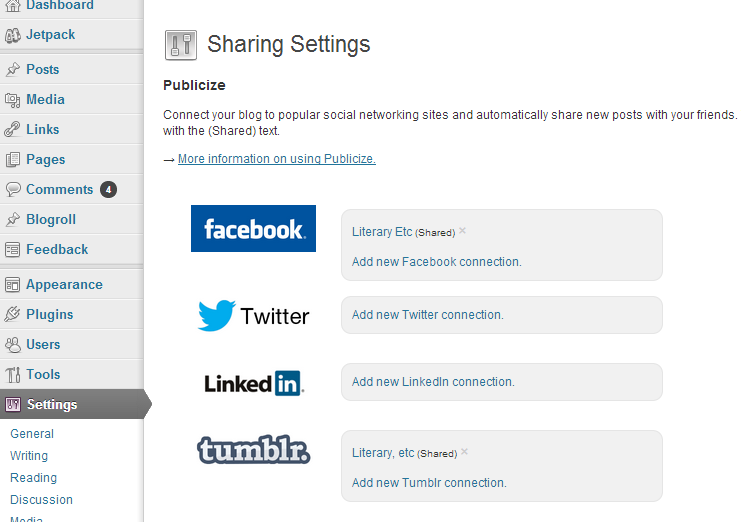 I’m on Blogger and I don’t believe there is a share setting for Tumblr; I think that would require an IFTTT recipe. The only con to that is that blog posts in their entirety; there is no way (that I know of) to do a partial feed and link back to the original post.